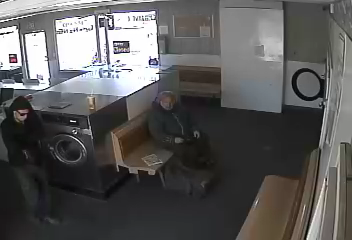 April 14: The Mojave Coin wash was burglarized twice last week – once on Saturday April 5th, and again on Monday April 7th, and will be closed until the suspect is brought to justice. Both burglaries were carried out by the same male pictured here, as captured by surveillance video, and occurred in broad daylight around 11:30 a.m. The suspect was seen on video beating the coin dispenser with a crow bar for about 17 minutes on Saturday, stealing approximately $245 worth of coins. The suspect returned again on Monday and continued to beat one of the washer machines late in the morning until it yielded $160 worth of coins. The suspect appears in the surveillance video to have light or Caucasian skin, in his 20s, shaved head or buzz cut, muscular build, and tattoos on his forearms, hands and neck. 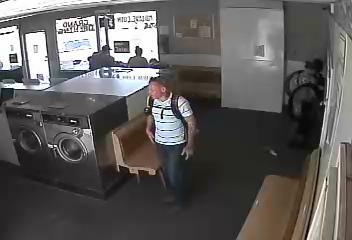 He was wearing a light blue polo shirt with black horizontal stripes and sun glasses over his head, and changed into a white long-sleeved shirt, and again into a black hoodie. During the burglary he carried a reddish backpack with plaid pattern, buttoned in the front. The suspect was also seen interacting with passers-by outside the store and is believed to either live in Mojave, or at least know people who live in Mojave. The suspect also had some help. There was a female in the coin wash acting as a lookout. She is described as being Caucasian, in her 20s, with red hair, thin, and wearing a pink-ish shirt with a floral pattern. There was also a secondary lookout stationed outside the Coin Wash, who was either African-American or Hispanic, on a bicycle, in dark clothing. 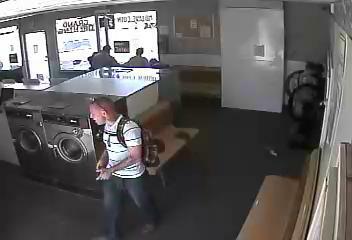 The Coin Wash, a Mojave landmark, will be closed until the suspects are caught. 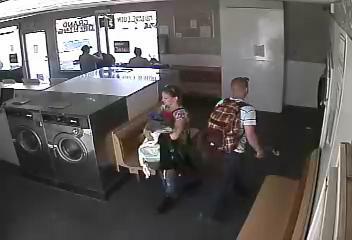 The owner of the Coin Wash and Mojave Chamber of Commerce are offering a $1500 reward for information leading to the arrest and conviction of any of these individuals. Residents are asked to contact the Sheriff with any information at 661-824-7130, or the owner of the Coin Wash, Christy, at 661-803-7982. The Mojave Foundation takes this theft personally, and considers it an assault on our residents who rely on this coin wash for their children and families, and our businesses who have invested in our community. We will work tirelessly to bring these suspects to justice, and encourage all residents to volunteer with our local Sheriff’s office through in our Citizen Service Unit (CSU). We are also fundraising for a community surveillance system and street lights centered on the intersection of K Street and Inyo. Anyone interested in supporting our efforts can make a tax-deductible donation on our website, or click here to fill out an application for CSU. This entry was posted in Crime, Entrepreneurship, Mojave CA, Mojave Coin Wash, Security on April 14, 2014 by mojavefoundation. I posted this on my FB page. I hope you catch them. Thank you Barb. The only way we catch suspects like this is if we all begin to take notice of our surroundings. This crime happened in broad daylight, with dozens of witnesses only a few feet away at the bus stop, but nobody stopped to notice that something, or someone, was out of place. We also need more CSU volunteers – if I can get 30 volunteers, I can put a CSU car on the street every day of the week. We’re also fundraising for a community surveillance system for that entire block at the corner of Inyo & K st. If I can raise $3,000 we can observe every inch of that block – day or night.